There were several other Germany-based bands called Obscurity. This act was formed in the west of the country in 1997. The band issued a demo called The Rebirth Of The Dark Empire. Another demo, called Christian Decay, arrived in 1999. A 2000 demo was called Bergisch Land. 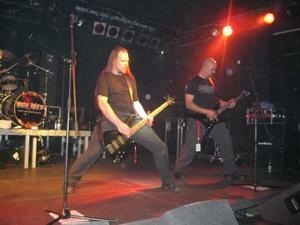 Despite hailing from Germany, the band adopted a Viking image. The band’s official debut album arrived in 2003. Founding member Dornaz left however. He returned in 2007 to commemorate the group’s tenth anniversary. Nezrac left in 2008. He missed the band and hated his job so returned a year later. Twilight typically distributed existing recordings. The band next moved to Massacre Records, which is barely a step up. Drummer Zorn (Marc Dzierzon) of Dew-Scented joined in 2018 replacing Draugr who stayed with the band a mere year. The band calls its music ‘battle metal.’ The group has played at Heidenfest Tour, the Pagan Fest Tour, Rock Harz, Ragnarök and Turock Open Air. The band’s nationalism is amplified through its use of the Bergisch Lion as a symbol. The 666th Obscurity to roam this planet earth is here and with an album that truly delivers in every respect. Be it speed, heaviness, brutality or bestial Germanic vocals this unlikely group hits hard and with precision. Obscurity has the added benefit of an improbable catchiness that sets the band apart. Fans of Impaled Nazarene, Dawn and even Slayer will really dig this incredible release.